NEW YORK (CNS) — Moviegoers of a certain age will remember the movement to boycott grapes — an effort to draw attention to the plight of agricultural workers, and exert economic pressure on their employers, that lasted throughout the latter half of the 1960s. If so, the namesake of the biographical film “Cesar Chavez” (Lionsgate) will also likely be familiar to them. 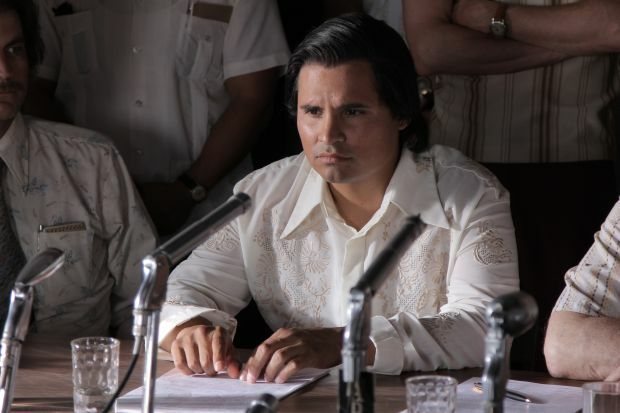 For those with only a vague memory of the famed labor leader and pacifist — played here by Michael Pena — director Diego Luna’s understated portrait will serve as a helpful reminder. For those to whom the details of Chavez’s career are a complete blank, it will provide a valuable introduction. In this leisurely paced dramatization, Chavez (1927-1993) works to organize his fellow field laborers. To do so, he has to struggle against the oppressive machinations of various farm owners, most prominently paternalistic Croatian immigrant and self-made-man John Bogdonovich (John Malkovich). He’s aided in his efforts by activist Dolores Huerta (Rosario Dawson) — in partnership with whom Chavez founded the union that would eventually be known as the United Farm Workers of America in 1962. Chavez gains another ally, as well as an admirer, in New York Sen. Robert F. Kennedy (Jack Holmes). Chavez’s single-minded dedication to achieving justice through nonviolence leads him, at one point, to undertake a prolonged, life-threatening fast. Like his constant absences from home, however, this dramatic gesture — designed to get his followers in the UFW to renew their commitment to an exclusively peaceful strategy — exacts a toll on his supportive wife Helen (America Ferrera) and alienated eldest son Fernando (Eli Vargas). Pena skillfully projects the image of a complex and attractive man, a shy soul of deep principle whose timid manner belies his ability to stand up to bullies — like overbearing local lawman Sheriff Smith (Michael Cudlitz), whose one-sided enforcement of the law is designed to benefit the growers. Believers will especially appreciate the fact that Chavez’s Catholic faith is always in the background and sometimes front and center as this meditative take on his story unfolds. At least one pivotal union meeting is held in a church, while Our Lady of Guadalupe adorns a UFW banner as Chavez and his cohorts make a 300 mile-long march — which they term a pilgrimage — to the California state capitol in Sacramento. This prominence of religious belief as well as the educational significance of Luna’s picture as a whole, may lead some parents to consider “Cesar Chavez” acceptable fare for older teens, despite the inclusion of the elements listed below. The film contains some violence, racial slurs, a few uses of profanity, at least one rough term and occasional crude and crass language. The Catholic News Service classification is A-III — adults. The Motion Picture Association of America rating is PG-13 — parents strongly cautioned. Some material may be inappropriate for children under 13. NEXT: Streaming TV for pre-teens: Fraught with peril or promise?